Whether your non-profit shares its PDF publications by email, Scribd.com, or elsewhere online, clickable links make it easy for readers to go to your website and take the next action. But the ability to retain hyperlinks when converting documents to PDF format has been missing from most of the free or low-cost web-based PDF tools to date. Finally, problem solved! 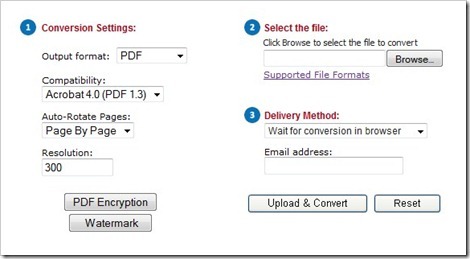 Here’s a free online document converter that can keep your links working in PDF format. Thanks to Donnie Maclurcan (@donmacca) of ProjectAustralia for sharing this find on Twitter! Neevia Document Converter lets you instantly create a PDF (or image) file from just about any common file format (Mac or Windows). Convert to PDF from a plain text document, RTF, Word, Write, WordPerfect, MS Works, Lotus, Excel and other word-processing or spreadsheet files, Adobe PostScript and PDF, MS Publisher, Powerpoint, Lotus Freelance, about 50 kinds of graphics... the list of supported file formats goes on and on. Just upload your file (1MB max) and select the conversion options you prefer; it’s that easy. Compress PDF – Upload a large PDF documents (5MB limit) and choose from a range of compression options to reduce its file size. Options include the ability to remove bookmarks, annotations, forms, and other file-bloating elements that may not be needed. Merge PDF – Merge up 20 separate PDF files (10 MB total upload limit) into one PDF document. Neevia is the company behind some pretty high-powered proprietary software for wrangling PDF documents, so it came as no big surprise that all four of the free online tools worked like a charm when tested. What did come as a very pleasant surprise, however, was how very quickly my test document conversions were completed and the new PDF files ready to view and download. Bookmarked! The free Microsoft PDF plugin for Office will retain clickable links. I believe OpenOffice retains links when converting docs to PDF format. The issue is whether the application used to convert the file to PDF settings set to retain the links. I've always found the on-line PDF generators to be effective but a clumsy way of doing a simple job. I just downloaded the free version of Primo pdf (www.primopdf.com). It installs itself as a printer on my computer. To create a pdf I just select Print from ANY program and then change the print dialog box so that instead of printing on my HP Officejet printer it "prints" a pdf file and gives it any name I select. It is completely analogous to issuing a Save As with file type of pdf. And, yes, links are saved. I found this blog post a few months ago and was really happy to get your recommendation for neevia. I turned into a huge neevia fan. But recently they changed something and now I can no longer use neevia. It won't even open my documents at all. I wrote to them and they acknowledged the change but they did not care at all that I was having problems with their programs. The command box that would pop up after using their product would specifically say to contact the PDF Converter Program to let them know that there is a problem. I copied/pasted that very command in an email to neevia but they just replied, "Works on our side." Their complete unhelpfulness has totally ruined this once huge fan as I now think very poorly of their service. I am now, once again, on the hunt for another program and am not finding any good options. Any other suggestions? Nadine, there are a large number of web apps that will convert to PDF, but I assume that retaining your clickable links is a priority? In that case, not sure what other web-based tool to suggest - especially without knowing what caused your issues with Neevia - but for software to install on your computer, you might try Gordon's suggestion of PrimoPDF (virtual printer) http://primopdf.com or convert your documents to PDF via Open Office http://openoffice.org - both are free.